Note: A paper delivered to the Regular Meeting n° 18 of Montefiore Lodge, Tel Aviv, the 29th of September 2002. The term "Landmarks" is known to all brethren, yet its' definition is not always as clear. Moreover, these Landmarks are often connected to the Old Charges. My aim here is to clarify these terms and draw distinct lines between three terms. the UGLE. Though they are said to be "Summary of the…" they are the only ones. them before he is obligated as WM. 3. Landmarks are basic principles of Freemasonry similar to axioms in mathematics. Freemasonry and what is outside of them. It should be stressed that boundary lines, or border marks, have in all ages been regarded by men as most important and zealously kept. In the Bible they are regarded as sacred. In Deuteronomy 27,17 we find: "Cursed be he that removeth his neighbor's landmark". Similar references can be found in Proverbs 22,28 and in Job 24,2. We should remember that such boundaries always imply that all recognizes them as such. It is obligatory that every Brother believes in the Great Architect of the Universe and that there must be an open VSL on the Altar when a lodge is at work. These are two of our Landmarks. They are not included in the Old Charges or in the Antient Charges and Regulations. On the other hand, Recognizing "only three degrees of EA, FC and MM and the Installation ceremony of a WM" is not a Landmark but part of the Antient Charges and Regulations. innovations in the body of Masonry"
3. It is agreed that it can never be changed. More often than not, when Landmarks are discussed, only two of these elements are mentioned, namely that they are 'from time immemorial' (ancient) and that they cannot be changed. Very often, any attempt to change even a trifle is met with criticism that it is against our Landmarks. In my view, the most important element is that a Landmark must express the form and essence of the Masonic body. Furthermore, the weakest element in this definition is the third part: what does it mean "agreed that it can never be changed"? Agreed by whom? When? And, if it will be agreed to change a Landmark, will it stop to express the essence of Freemasonry? It is almost like saying: a Landmark is a Landmark because we say so. Is this a definition? It seems to be generally accepted that not only did Landmarks set borders, but that they were recognized as such; they were considered as legitimate. One should realize, that in such a case if there is a general consent of all concerned, these borders may be changed. Indeed, the original phrasing of this clause included: "…without the consent first obtained of …Grand Lodge". This final part was omitted after the UGLE was formed. This was a significant change from an adjustable set of Landmarks to a full and final canonization. 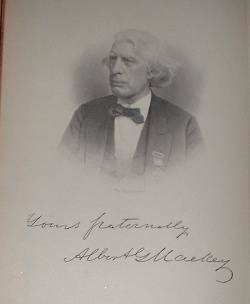 In his book "Speculative Masonry" , A.S. Macbride defined our Landmarks as "certain established usages and customs, occupying the position which usage and custom do in a community" namely, similar to 'common law' in a political system. These Landmarks are similar to civil laws but they differ in one respect: they were adopted by a Grand Lodge. At the same time, it should be pointed out that not every usage or custom is a Landmark; There must exist an additional condition: it has to serve as a border between what is within the boundaries of the Craft and what is outside these boundaries. Only such usages can become Landmarks. In other words: the Landmarks of Freemasonry are established usages and customs which serve as boundaries both inwards as well as outwards of a Masonic organization If we examine this definition closely, it will be apparent that it contains a goal; not only boundaries but such that conform to the goals of Speculative Freemasonry. It seems to me that the need to set Landmarks supports the 'Transition Theory' at least partly. When operative lodges started to accept non-operative Masons, and the building of a spiritual and moral temple became the central target, there arose the need to set agreed-upon boundaries. In other words: only Landmarks which serve the goals of speculative Masons were chosen from among the usages and customs already existing in the (operative) lodges. Just as the need of a lodge for the builders, before actual building was started, so do we need a set of rules before a human temple is erected for the building of a spiritual temple; for shaping the human rough ashlars in accordance with moral principles. 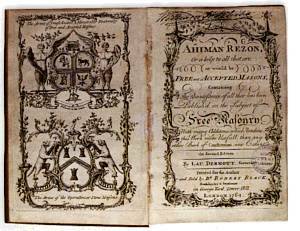 According to Macbride, the Landmarks listed in Dermot's 'Ahiman Rezon' (1756) about a hundred years before Mackey's Encyclopaedia was published, include several which do not conform with the typical goals of Landmarks as defined by Simons above. So did others in their lists of Landmarks, some of which were new inventions and not existing usages and customs. When we examine the twenty-five Landmarks of Mackey, it becomes clear, which Landmarks express the quintessence of Freemasonry and which express structural aspects only. If we accept Simons's definition of Landmarks, it is quite obvious that those Landmarks which deal only with Grand Master and Grand Lodge cannot be "from time immemorial". After all, these could not exist before 1717. Furthermore, they have nothing to do with 'a system of Morality'. The same applies to any Landmark concerning the third degree. Although the Hiramic legend is very old, the tri-gradal system was created only around 1730. As B.E. Jones rightly pointed out in his "Freemason's Guide & Compendium", although every Freemason has to observe the Landmarks, there is no authoritative definition of what is a Landmark, nor are they named in many Grand Lodge Constitutions. Masonic writers often quote Mackey's list of 25 Landmarks, which are fully listed by Jones. d. Those concerning the duties of a lodge, including inter-relations between lodges:§§. 10, 16. In my opinion, the last Landmark can hardly be regarded as a Landmark at all, since all it stipulates is that these Landmarks can never be changed. Certainly not when we know the self same Landmark was changed in 1823. All Landmarks concerning the Grand Master and Grand Lodge are obviously not 'from time immemorial' and have nothing to do with Freemasonry being 'a peculiar system of Morality'. The same goes to the last group above, since 'Private Lodges' existed well after 1717, so they too are not ancient. 2. Belief in resurrection and life hereafter. 3. Obligation to have an open VSL in lodge when at work. 4. The legend of the third degree. 7. A candidate must be male, free of birth and of age. No doubt, this concise list of Landmarks better relates to the absolute necessary boundaries of our Craft. Being a jurist by profession, Pound included as Landmarks only those which truly express the quintessence of Masonry and excluded those which are administrative in nature. The 24th Landmark in Mackey's list is almost identical with Pound's 6th Landmark, which is the connection between the operative Craft and our Speculative Freemasonry. One should note, that it does not make Speculative Freemasonry a direct descendent of operative Masonry; it only stipulates a connection between the two, adding a definite purpose to our moral speculations. There are several lists of Landmarks, the shortest containing only 7 (Pound's) and the largest nearly a hundred. The most well known is that of Mackey, containing 25 Landmarks. It is my hope that I have helped to better understanding of the meaning of our Landmarks. 2) The division of Symbolic Masonry into three degrees. 3) The Legend of the Third Degree. 4) The government of the fraternity by a presiding officer called a Grand Master. 5) The prerogative of the Grand Master to preside over every assembly of the craft. 6) The prerogative of the Grand Master to grant Dispensations for conferring degrees at irregular times. 7) The prerogative of the Grand Master to give dispensations for opening and holding Lodges. 8) The prerogative of the Grand Master to make masons at sight. 9) The necessity of masons to congregate in lodges. 10) The government of the craft, when so congregated in a Lodge by a Master and two Wardens. 11) The necessity that every lodge, when congregated, should be duly tiled. 12) The right of every mason to be represented in all general meetings of the craft and to instruct his representatives. 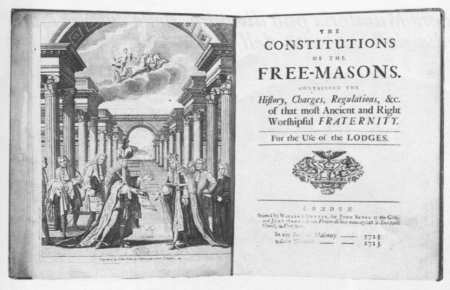 13) The Right of every mason to appeal from the decision of his brethren in Lodge convened, to the Grand Lodge or General Assembly of Masons. 14) The right of every mason to visit and sit in every regular Lodge. 15) No visitor, unknown as a mason, can enter a Lodge without first passing an examination according to ancient usage. 16) No Lodge can interfere in the business of another Lodge, nor give degrees to brethren who are members of other Lodges. 17) Every freemason is amenable to the Laws and Regulations of the masonic jurisdiction in which he resides. 18) Qualifications of a candidate: that he shall be a man, unmultilated, free born, and of mature age. 19) A belief in the existence of God. 20) Subsidiary to this belief in God, is the belief in a resurrection to a future life. 21) A "Book of the Law" shall constitute an indispensable part of the furniture of every Lodge. 22) The equality of all masons. 23) The secrecy of the institution. 24) The foundation of a Speculative Science, for purposes of religious or moral teaching. 25) These Landmarks can never be changed. J. W. Simons, The Principles of Masonic Jurisprudence"
 T. O Haunch, Prestonian Lecture for 1972, which was a study in change. Published by Southern Publishers Inc, Masonic Publications Division, 1924.